The total phase acquired during an evolution of a quantal system generally consists of two components: the usual dynamical phase which is dependent on dynamical properties like energy or time, and a geometric phase, which is, considering a spin 1/2 system, minus half the solid angle of the curve traced out in ray space. First we give a summary of the theoretical framework as introduced in a paper by Reinhold A. Bertlmann 1 before the actual neutron interferometric experiment is explained. Particle , moving in -direction, is interacting with a time-dependent magnetic field with unit vector . 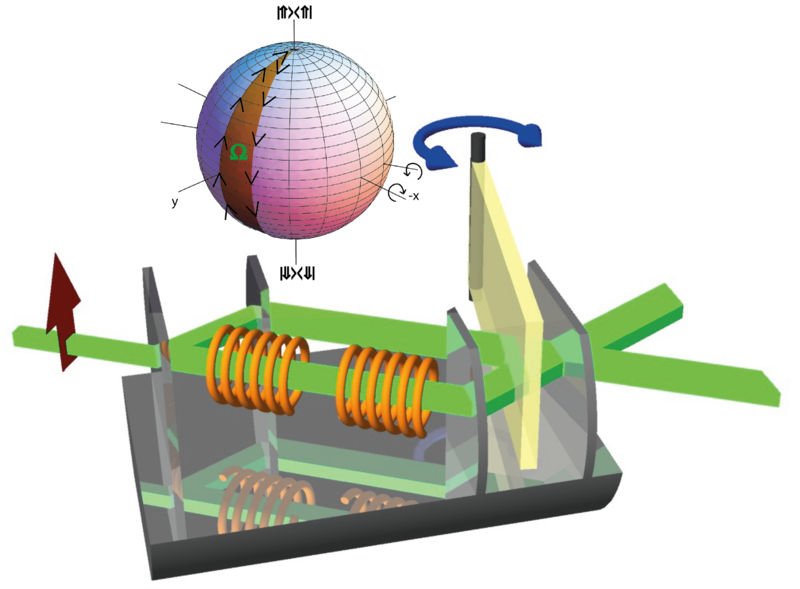 The magnetic field rotates slowly with an angular velocity around the -axis under an angle , which is schematically illustrated below. Without loss of generality one angle can be eliminated by setting, e.g., (). Keeping the polar angles constant at the usual Bell angles (and azimuthal parts fixed at ) is given by, where the familiar maximum value of is reached for . For the value of approaches zero. Polar Angle Adjustment – Here the case is considered when the azimuthal angles are kept constant, e.g., . The polar Bell angles yielding a maximum -value, can be determined, with respect to the geometric phase , by calculating the partial derivatives (the extremum condition) of . The solutions are given by , . With these angles the maximal decreases for and touches at even the limit of the CHSH inequality .